Early morning on the little mangrove beach, flies gather on leaves to watch the sunrise. Maybe they spend the nights there. It's not a matter of warmth as the air is already 84 degrees F. About 30 minutes after sunrise, they fly away to forage nectar and scan the beaches for dead fish. 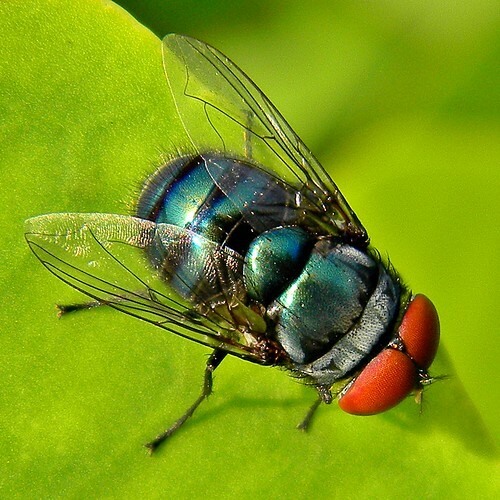 This colorful fly is an exotic species that has been extending it's range into Florida, California and other warm weather states. It's two good qualities are that it is an excellent pollinator of mango trees (and, based upon my observations, several other plants) and it's useful in forensic entomology (think Gil Grissom on CSI). It has very uncomplimentary common names.